Everyone knows the Corvette, as in Chevy. Do you know the Corvette from Chris-Craft? Prior to this past summer I had seen them in photos only. I finally saw one real time at the antique and classic boat show in Salem, MA. 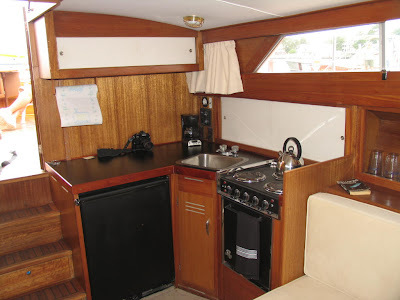 Wow, what a great looking boat…1969 model year, 36′. 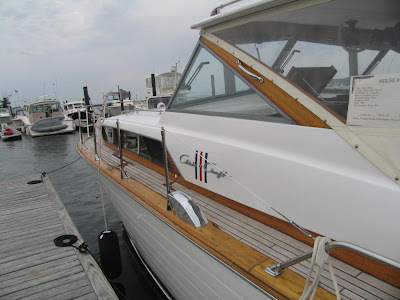 Given my fascination with everyting Fifties, especially wooden boats, I was surprised how attracted I was to this boat…but then again, its a Chris-Craft. I was in awe of the simple beauty and grace of the boat’s lines, style, and its understated yet bold statement in design (then and now). 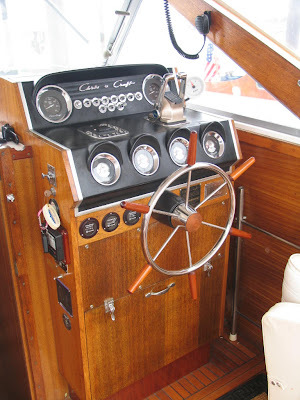 The highlight may have been the helm…what a combination of classic wood and chrome with sporty black dash, gauges and control panel. The owner had done a beautiful restoration of the boat…once aboard I of course yearned to hear the engines, untie the boat, head out on the water to really experience this ‘Vette’s performance (I’ve ridden in the car, never the boat), and maybe go back in time: 1969 — well into the fiberglass era, yet Chris-Craft was still building some gorgeous and timeless wooden boats. 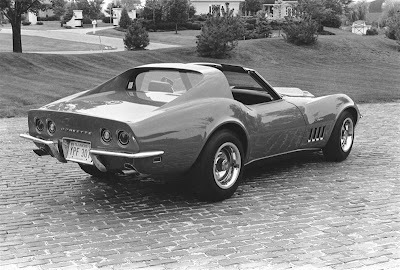 As with the U.S. at the time, in great turmoil, change is never easy for companies this big and successful, yet Chris-Craft and Chevy and the “Corvette” managed to change and yet maintain their appeal in the world of sports cars and sports cruisers. The ’69 Chris-Craft model was built on a deep-V Jim Wynn hull design, with twin 427 300 hp Lincoln engines (as with the cars, these boats had LOTS of power to go with their great looks). Only 16 of these boats were built in 1969. At the New York Boat Show in ’69 it was reported that “People stood in line for what seemed to be hours to get up on the platform to get a look at it….the thing that impressed people was the huge round black helm and companion seats. They couldn’t have recieved more attention if they had been gold plated.” (See About the Chris-Crafts, by Charles C. Cross, Brass Bell, Dec., 1988). 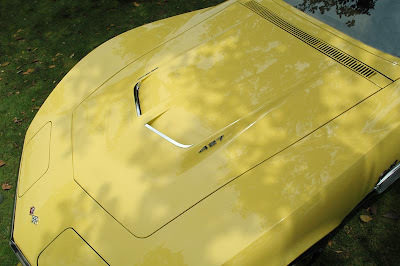 The more I learned and saw of the Corvette, the more curious I was about its history. 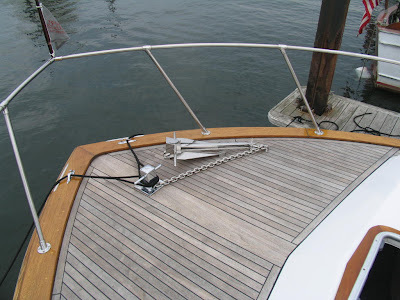 Its production by Chris-Craft began in 1953-1954. There were 36 built for that model year, and over 50 of the 37 foot model in 1955. Seeing the 1969 model, one would think the name came from the car. Actually the model was named after the Canadian wartime Torpedo Boat. t a Fifties Sea Skiff has great lines, this is one gorgeous, classic Chris-Craft cruiser with a low and very pleasing profile. 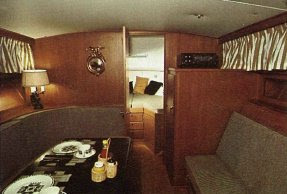 The custom edition as shown below had hull sides painted a dull black and teak substituted for mahogany on the forward deck, side decks, bridge deck floor and aft cockpit floor, with pure white canvas on the hull top. That is very cool, I had a corvette Schwinn bike. The boat wins hands down..Great article. 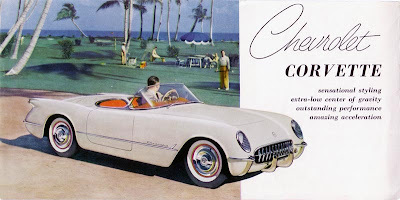 The ’54 Corvette does indeed make a clear statement of true Americana, doesn’t it? They, along with the Capitan, the Futura and the early wood Commanders are among my all-time favorite Chris Craft cruisers. According to Jerry Conrad’s “Chris Craft – The Essential Guide”, only 10 of the ’55, 37′ models were built. 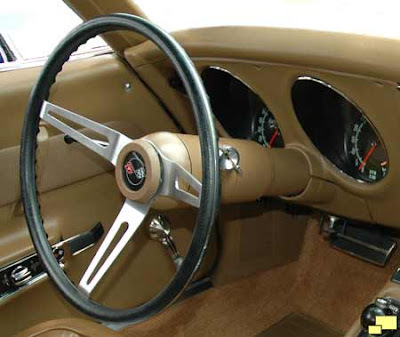 The ’68, 36′ Corvette cruiser was well ahead of its time in design and appears to have lead the direction that more modern cruisers would soon follow. It’s much the same in appearance as the 1977 37′ fiberglass model. So this is even more rare than i thought…funny the article from BB gave hull nos for the ’55 into the 50s, and credited Jerry Conrad on the information…he must have subsequently found they actually only made 10…those custom models with the black hull and white canvas must have been stunning!